The West Vancouver Football Club and the Steven Family are pleased to announce the presentation of the Mark Steven Soccer Scholarship for West Van Secondary graduating students. This educational bursary of $2000 ($1000 each for one male and one female player) will be presented annually to a male and female West Van Football Club player. From a young age Mark was committed to doing his best. This was demonstrated in his professional career as a lawyer and translated to the benefit of many others with his countless hours of volunteering in the West Vancouver community (Coaching, West Vancouver Sport Group, West Vancouver Soccer Club board member and the soccer disciplinary board). Sadly, Mark is no longer with us; however, his spirit lives on with his two boys (Derek and Colin Steven, WVSS Alumni 2004 and 2010 respectively) who are excited to present this opportunity. Reference letter from your High school (ie: principal, vice principal, Teacher, counselor, etc...). Your background involvement in soccer as a player, referee, assistant coach, etc..
History of your volunteer activities outside the school and in your community. 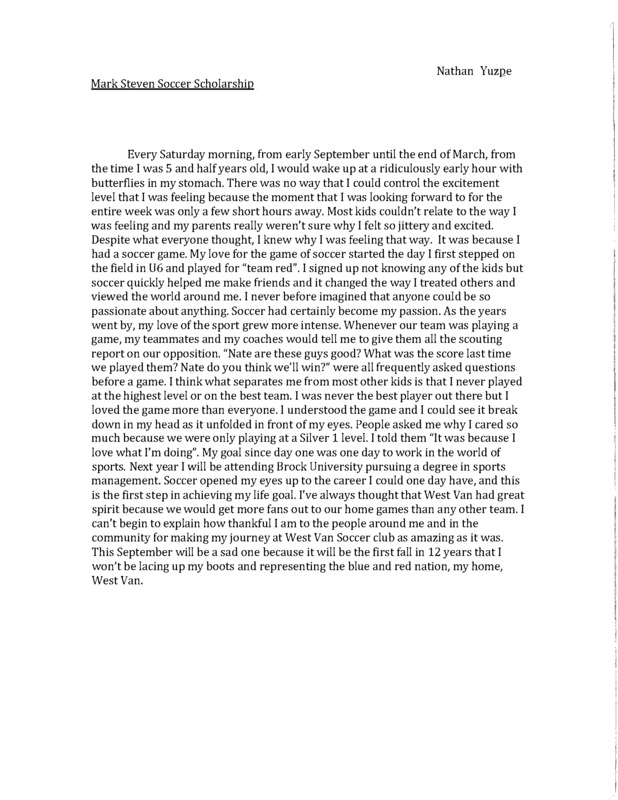 Letter from your current coach in WVFC. Please forward your application to Ruth Burr, WVFC President @ P.O. Box 91172, West Vancouver, B.C. V7V 3N8. Please note the deadline for applications is April 12, 2019. Good luck to everyone! A scholarship application from a few years ago. We hope that there are many others who, when they think about being a part of WVSC, have feelings and memories like Nathan's. We think that this exemplifies the value of sports and the role they can play in our lives.